There has been a rise in schools and clubs installing athletics track and field facilities in the UK and we can offer advice on high jump funding to help you get a great new surface. Track and field events have gained popularity over the past few years with many young people looking to get involved in activities at schools and local clubs. In order for children to achieve their goals and get the best training, high quality athletics facilities and equipment are essential. However the problem with this is many schools and clubs don’t have the budget to install new surfaces or renovate their existing ones. This is where high jump funding can lend a helping hand to organisations who can’t afford the cost involved with building a new run up and buying specialist equipment. Throughout the UK there are numerous funding bodies who offer grants for projects which improve health, activity and community cohesion. The installation of a high jump surface can meet these aims by encouraging more young people to get involved in extracurricular sporting activities. A top quality high jump fan can also be rented out to members of the local community and other groups who can make use of the area. Depending on the level of ability and participation, these surfaces can be installed in one of two specifications through funding. Multisport synthetic turf is the most cost effective option for schools and small practise areas, whereas polymeric rubber should be installed for professional IAAF quality facilities. 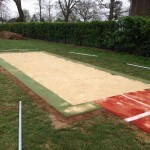 More information on these surface types can be found if you click here – https://www.sportsandsafetysurfaces.co.uk/athletics/athletics-track/surfacing/ – you can also fill in our contact form to discuss this with a member of our team. As well as high jump funding there are also a number of UK athletics grants available for other facilities such as running tracks, long jump runway areas and other track and field surfaces. 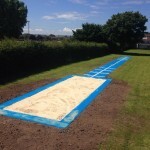 We are experienced installers for each of these track and field surface types and can provide advice on the whole process including cost estimates help with applying for funding. Many schools and clubs have already benefited from high jump funding and other UK athletics grants to improve their existing facilities or install brand new areas. These surfaces come in a range of specifications and a bespoke design can be made to suit different uses. We cater to professional level run up areas, recreational practise spaces and everything in between for schools, universities, colleges and sports clubs. If you need some helpful and professional advice on UK athletics grants and the opportunities available to you, send us your details through the quick form on this page. We have worked with many UK organisation to source high jump funding and financial help with other installations to feel free to ask us any questions you have.